Given the limitations of precise dating, uncertain provenance, and an uneven literature, what can be learned about woodworking tools after 1600? In some instances, design change can be noted and documented to provide at least a general criteria for dating. Frequently, the original appearance of tools can be documented. For some hand tools, characteristics can be established that denote a national origin. Not infrequently a tool’s style, decorative motif, or similarity to other objects that coexisted at a given time can suggest, even in relatively modern times, the values of the society that produced it. The source of such information derived from the hand tool is generally visual, recorded in the tool itself or in pictures of it and supported by manuscript and printed material. Survey the principal printed sources of the 17th, 18th, and 19th centuries. The first thing that is apparent is a remarkable proliferation of tool types without any significant change in the definition and description of the carpenter’s or joiner’s task. Begin in 1685 with Charles Hoole’s translation of Johann Amos Comenius’ Orbis Sensualium Pictus for use as a Latin grammar. 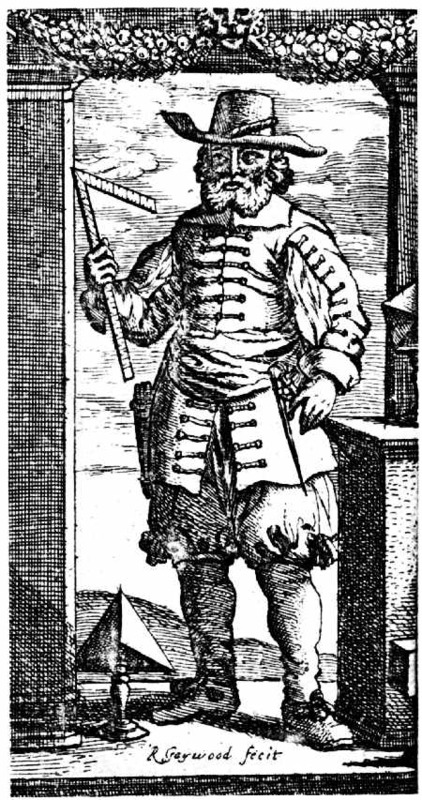 Among the occupations chosen to illustrate vocabulary and usage were the carpenter (fig. 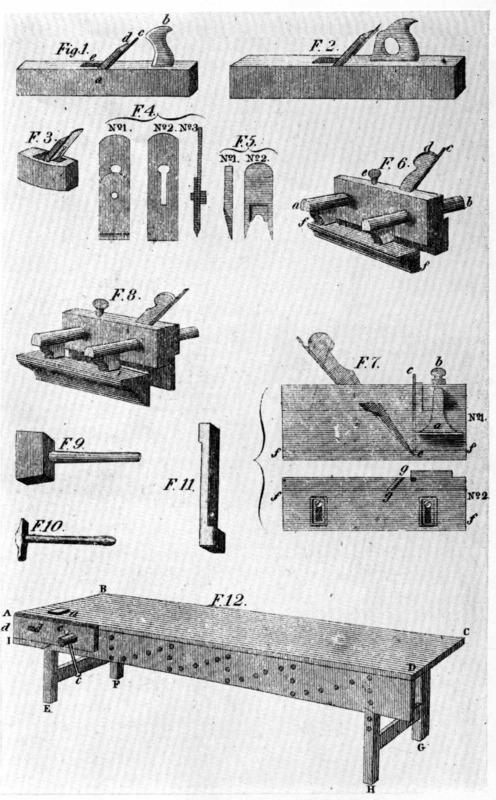 1), the boxmaker (cabinetmaker), and the turner (fig. 2). “The Carpenter,” according to Hoole’s text, “squareth Timber with a Chip ax … and saweth it with a Saw” while the more specialized “Box-maker, smootheth hewen-Boards with a Plain upon a Work-board, he maketh them very smooth with a little plain, he boarth them thorow with an Augre, carveth them with a Knife, fasteneth them together with Glew, and Cramp-irons, and maketh Tables, Boards, Chests &c.” Hoole repeated Comenius’ plates with the result that the craftsman’s tools and his work have the same characteristic medieval flavor as the text. 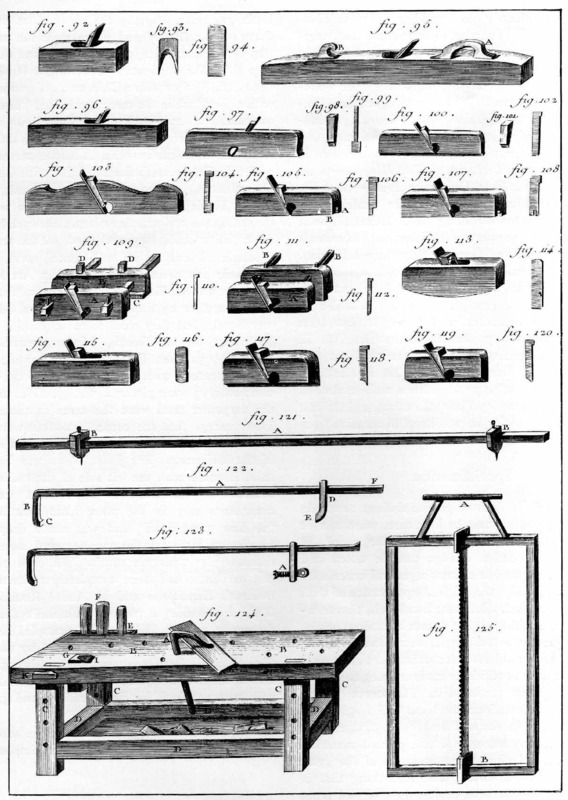 Joseph Moxon in his well-quoted work on the mechanic arts defined joinery as “an Art Manual, whereby several Pieces of Wood are so fitted and join’d together by Straight-line, Squares, Miters or any Bevel, that they shall seem one intire Piece.” Including the workbench, Moxon described and illustrated 30 tools (fig. 3) needed by the joiner. 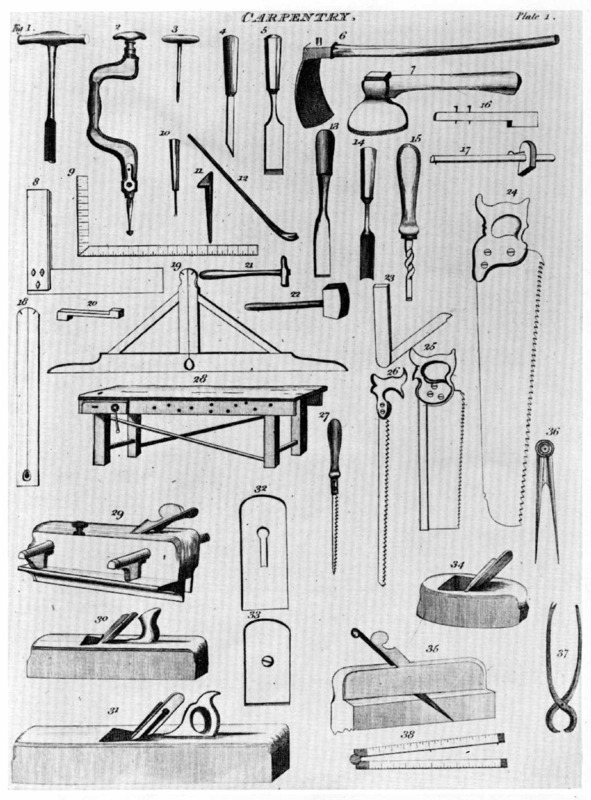 The carpenter’s tools were less favored by illustration; only 13 were pictured (fig. 4). The tools that the carpenter used were the same as those of the joiner except that the carpenter’s tools were structurally stronger. The axe serves as a good example of the difference. The joiner’s axe was light and short handled with the left side of the cutting edge bezeled to accommodate one-handed use. The carpenter’s axe, on the other hand, was intended “to hew great Stuff” and was made deeper and heavier to facilitate the squaring and beveling of timbers. 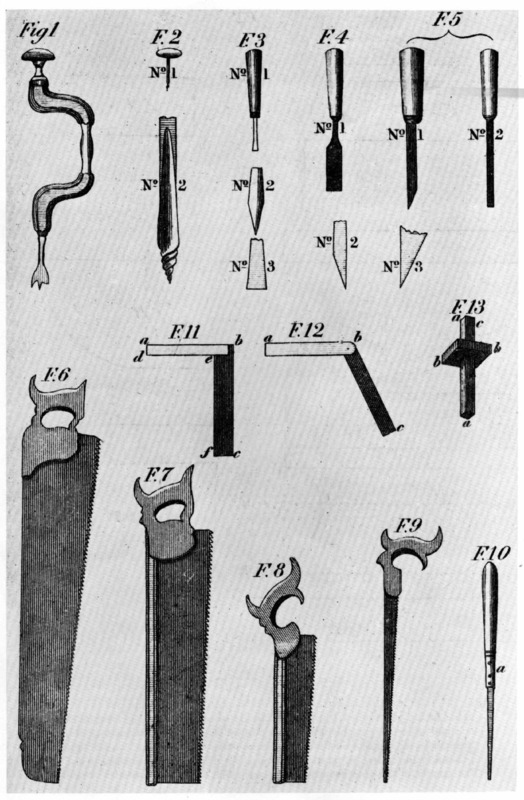 By mid-18th century the craft of joiner and carpenter had been completely rationalized in Diderot’s Encyclopédie and by André Roubo in his L’Art du menuisier, a part of Duhamel’s Descriptions des arts et métiers. 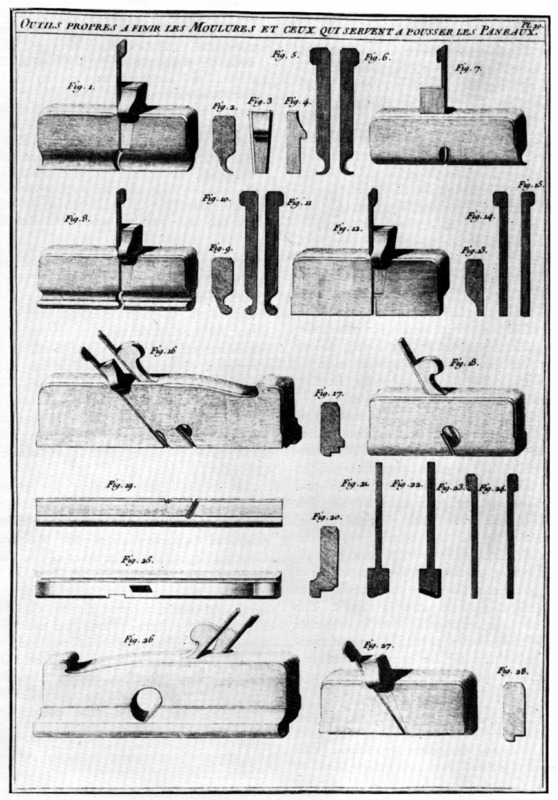 Diderot, for example, illustrates 14 bench planes alone, generally used by the joiner (fig. 5), while Roubo suggests the steady sophistication of the art in a plate showing the special planes and irons required for fine molding and paneling (fig. 6). Despite such thoroughness, without the addition of the several plates it would be almost impossible to visualize, through the descriptive text alone, the work of the carpenter and joiner except, of course, in modern terms. 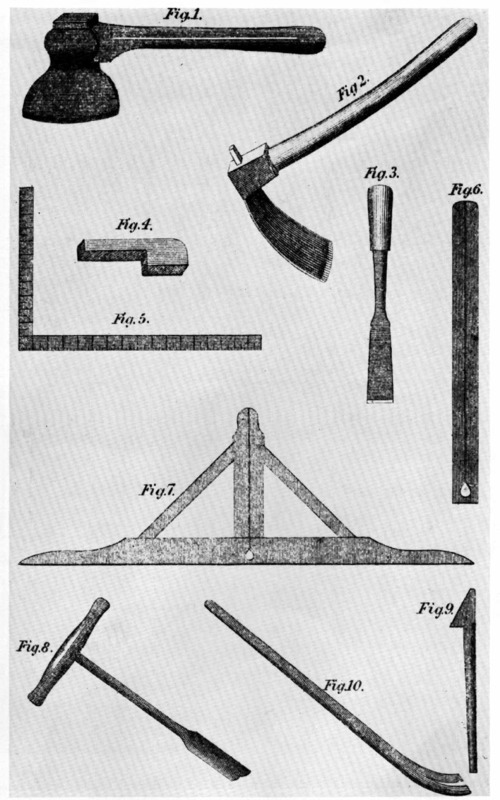 This is particularly true of the numerous texts on building, such as Batty Langley’s The Builder’s Complete Assistant (1738) and Francis Price’s The British Carpenter (1765), where building techniques are well described but illustration of tools is omitted. This inadequacy grows. In two 19th-century American editions of British works, The Book of Trades, printed at Philadelphia in 1807, and Hazen’s Panorama of the Professions and Trades (1838), the descriptions of the carpenter’s trade are extremely elementary. Thomas Martin’s Circle of the Mechanical Arts (1813), although far more thorough than many texts, still defined carpentry “as the art of cutting out, framing, and joining large pieces of wood, to be used in building” and joinery as “small work” or what “is called by the French, menuiserie.” Martin enumerated 16 tools most useful to the carpenter and 21 commonly used by the joiner; in summary, he noted, as had Moxon, that “both these arts are subservient to architecture, being employed in raising, roofing, flooring and ornamenting buildings of all kinds” (fig. 7). In Peter Nicholson’s The Mechanic’s Companion (figs. 8, 9, and 10), the all-too-familiar definition of carpentry as “the art of employing timber in the construction of buildings” suggests very little of the carpenter’s actual work or the improvement in tool design that had occurred since Moxon’s Exercises. 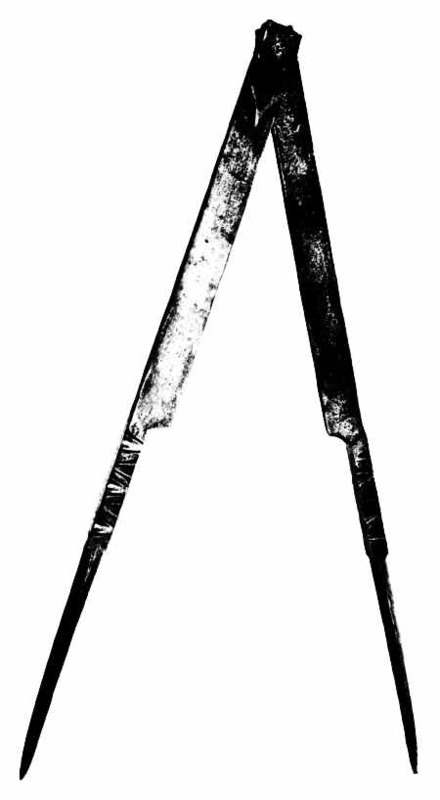 From Nicholson’s list of the tools required by the carpenter—”a ripping saw, a hand saw, an axe, an adze, a socket chisel, a firmer chisel, a ripping chisel, an auguer, a gimlet, a hammer, a mallet, a pair of pincers, and sometimes planes”—there would seem at first glance slight advance since the 1600’s. The enumeration of the joiner’s tools, however, indicates a considerable proliferation, particularly when compared to earlier writers. By the early 19th century, the more refined work of joinery required over 50 tools. The bench planes [instructed Nicholson] are, the jack plane, the fore plane, the trying plane, the long plane, the jointer, and the smoothing plane; the cylindric plane, the compass and forkstaff planes; the straight block, for straightening short edges. Rebating planes are the moving fillister, the sash fillister, the common rebating plane, the side rebating plane. Grooving planes are the plough and dado grooving planes. Moulding planes are sinking snipebills, side snipebills, beads, hollows and rounds, ovolos and ogees. Boring tools are: gimlets, bradawls, stock, and bits. Instruments for dividing the wood, are principally the ripping saw, the half ripper, the hand saw, the panel saw, the tenon saw, the carcase saw, the sash saw, the compass saw, the keyhole saw, and turning saw. Tools used for forming the angles of two adjoining surfaces, are squares and bevels. Tools used for drawing parallel lines are gauges. Edge tools are the firmer chisel, the mortise chisel, the socket chisel, the gouge, the hatchet, the adze, the drawing knife. Tools for knocking upon wood and iron are, the mallet and hammer. Implements for sharpening tools are the grinding stone, the rub stone, and the oil or whet stone. Reflecting what the text writers listed, toolmakers by the end of the 18th century gave buyers a wide choice. 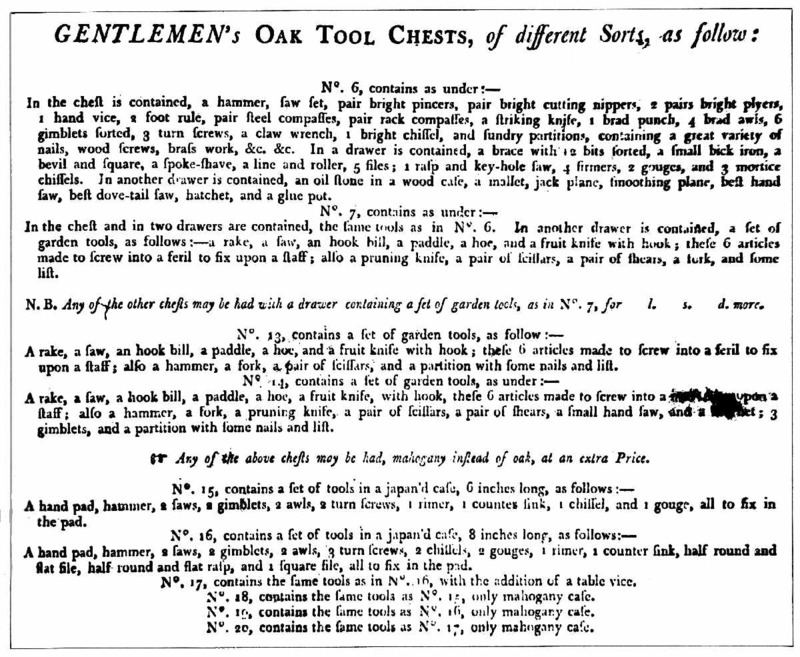 The catalogue of Sheffield’s Castle Hill Works offered 20 combinations of ready-stocked tool chests; the simplest contained 12 carpenter’s tools and the most complex, 39, plus, if desired, an additional assortment of gardening implements (fig. 11). 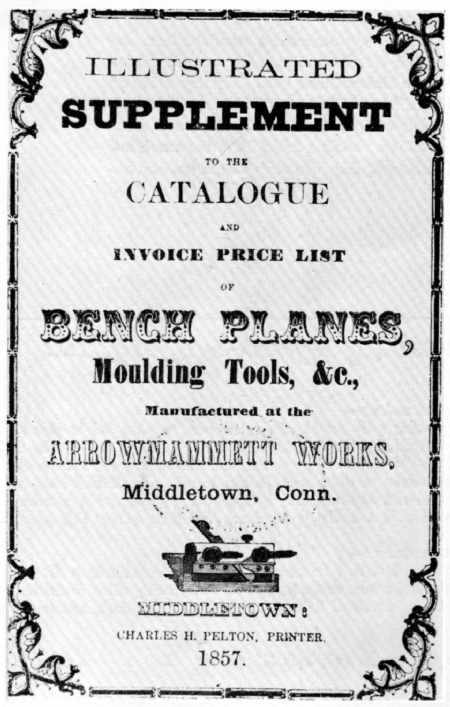 In 1857, the Arrowmammett Works of Middletown, Connecticut, producers of bench and molding planes, published an illustrated catalogue that offered 34 distinct types that included everything from hollows and rounds to double jointers and hand-rail planes (fig. 12). By 1900, the carpenter’s tool chest, fully stocked and fit for the finest craftsman, contained 90 or more tools. Specialization is readily apparent; the change in, and achievement of, the ultimate design of a specific tool is not so easily pinpointed. Only by comparing illustrations and surviving examples can such an evolution be appreciated and in the process, whether pondering the metamorphosis of a plane, a brace and bit, or an auger, the various stages of change encountered coincide with the rise of modern industrial society.